Archimedes (Greek: Ἀρχιμήδης) (c. 287 B.C.E. –212 B.C.E.) was an ancient Greek mathematician, physicist, engineer, astronomer, and philosopher, considered one of the greatest mathematicians in antiquity. Archimedes apparently studied mathematics in Alexandria, but lived most of his life in Syracuse. He discovered how to find the volume of a sphere and determined the value of Pi; developed a way of counting using zeros to represent powers of ten; discovered a formula to find the area under a curve and the amount of space enclosed by a curve; and may have been the first to use integral calculus. Archimedes also invented the field of statics, enunciated the law of the lever, the law of equilibrium of fluids, and the law of buoyancy. He was the first to identify the concept of center of gravity, and he found the centers of gravity of various geometric figures, including triangles, paraboloids, and hemispheres, assuming the uniform density of their interiors. Using only ancient Greek geometry, he also gave the equilibrium positions of floating sections of paraboloids as a function of their height, a feat that would be challenging for a modern physicist using calculus. Archimedes only became widely known as a mathematician after Eutocius brought out editions of some of his works, with commentaries, in the sixth century C.E. Ancient writers were more interested in his inventions and in the ingenious war machines which he developed than in his achievements in mathematics. Plutarch recounts how Archimedes’ war machines defended Syracuse against Roman attackers during the Second Punic War. Many of Archimedes’ works were lost when the Library of Alexandria was burnt (twice), and survived only in Latin or Arabic translations. Archimedes was born in the seaport colony of Syracuse, Magna Graecia (now Sicily), around 287 B.C.E. He studied in Alexandria and then returned to Syracuse, where he spent the rest of his life. Much of what is known about Archimedes comes from the prefaces to his works and from stories related by Plutarch, Livy and other ancient historiographers. The preface to The Sand Reckoner tells us that Archimedes’ father, Phidias, was an astronomer. In the preface to On Spirals, Archimedes relates that he often sent his friends in Alexandria statements of his latest theorems, but without giving proofs. Some of the mathematicians there had claimed his results as their own, so Archimedes says that on the last occasion when he sent them theorems he included two which were false, “… so that those who claim to discover everything, but produce no proofs of the same, may be confuted as having pretended to discover the impossible.” He regarded Conon of Samos, one of the mathematicians at Alexandria, as a close friend and admired him for his abilities as a mathematician. The dedication of The Sand Reckoner to Gelon, the son of King Hieron, is evidence that Archimedes was close to the family of King Hieron II. Plutarch’s biography of a Roman soldier, Marcellus, who captured Syracuse in 212 B.C.E., also tells us that Archimedes was related to King Hieron II of Syracuse. The same biography contends that Archimedes, possessing a lofty spirit and profound soul, refused to write any treatise on engineering or mechanics but preferred to devote himself to the study of pure geometry and pursued it without regard for food or personal hygiene. Plutarch also gives three accounts of the death of Archimedes at the hands of the Roman soldiers. Although Marcellus ordered that Archimedes not be harmed, Roman soldiers came upon him at work and brutally murdered him. These stories seem designed to contrast the high-mindedness of the Greeks with the blunt insensitivity and brutality of the Roman soldiers. Archimedes is considered by most historians of mathematics as one of the greatest mathematicians of all time. In creativity and insight, Archimedes exceeded any other European mathematician prior to the European Renaissance. Archimedes' works were not generally recognized, even in classical antiquity, though individual works were often quoted by three eminent mathematicians of Alexandria, Heron, Pappus and Theon, and only became widely known after Eutocius brought out editions of some of them, with commentaries, in the sixth century C.E. Many of Archimedes’ works were lost when the library of Alexandria was burnt (twice), and survived only in Latin or Arabic translations. The surviving works include On Plane Equilibriums (two books), Quadrature of the Parabola, On the Sphere and Cylinder (two books), On Spirals, On Conoids and Spheroids, On Floating Bodies (two books), Measurement of a Circle, and The Sand Reckoner. In the summer of 1906, J. L. Heiberg, professor of classical philology at the University of Copenhagen, discovered a tenth century manuscript which included Archimedes' work The Method, which provides a remarkable insight into how Archimedes made many of his discoveries. Numerous references to Archimedes in the works of ancient writers are concerned more with Archimedes’ inventions, particularly those machines which were used as engines of war, than with his discoveries in mathematics. King Hiero II, who was rumored to be Archimedes' uncle, commissioned him to design and fabricate a new class of ships for his navy. Hiero II had promised large caches of grain to the Romans in the north in return for peace. Unable to deliver the promised amount, Hiero II commissioned Archimedes to develop a large, luxurious supply and war barge for his navy. The ship, coined Saracussia, after its nation, may be mythical. There is no record on foundry art, nor any other period pieces depicting its creation. It is solely substantiated by a description from Plato, who said "it was the grandest equation ever to sail." The Archimedes' screw lifts water to higher levels for irrigation. It is said that the Archimedes Screw, a device which draws water up, was developed as a tool to remove bilge water from ships. Archimedes became well-known for his involvement in the defense of Syracuse, Italy against the Roman attack during the Second Punic War. In his biography of Marcellus, Plutarch describes how Archimedes held the Romans at bay with war machines of his own design, and was able to move a full-size ship complete with crew and cargo with a compound pulley by pulling a single rope. One of his inventions used for military defense of Syracuse against the invading Romans was the “claw of Archimedes.” Archimedes also has been credited with improving accuracy, range and power of the catapult, and with the possible invention of the odometer during the First Punic War. It is said that Archimedes prevented one Roman attack on Syracuse by using a large array of mirrors (speculated to have been highly polished shields) to reflect concentrated sunlight onto the attacking ships, causing them to catch fire. This popular legend, dubbed the "Archimedes death ray," has been tested many times since the Renaissance and often discredited. It seems the ships would have had to be virtually motionless and very close to shore for them to ignite, an unlikely scenario during a battle. A group at Massachusetts Institute of Technology have performed their own tests and concluded that the mirror weapon was a possibility. , although later tests of their system showed it to be ineffective in conditions that more closely matched the described siege. The television show Mythbusters also took on the challenge of recreating the weapon and concluded that while it was possible to light a ship on fire, it would have to be stationary at a specified distance during the hottest part of a very bright, hot day, and would require several hundred troops carefully aiming mirrors while under attack. These unlikely conditions combined with the availability of other simpler methods, such as ballistae with flaming bolts, led the team to believe that the heat ray was far too impractical to be used, and probably just a myth. The story of Archimedes discovering buoyancy while sitting in his bathtub is described in Book 9 of De architectura by Vitruvius. King Hiero had given a goldsmith the exact amount of gold to make a sacred gold wreath. When Hiero received it, the wreath had the correct weight but the monarch suspected that some silver had been used instead of the gold. Since he could not prove it without destroying the wreath, he brought the problem to Archimedes. One day while considering the question, "the wise one" entered his bathtub and recognized that the amount of water that overflowed the tub was proportional to the amount of his body that was submerged. This observation is now known as Archimedes' Principle and gave him the means to measure the mass of the gold wreath. He was so excited that he ran naked through the streets of Syracuse shouting "Eureka! eureka!" (I have found it!). The dishonest goldsmith was brought to justice. The buoyant force is equal to the weight of the displaced fluid. 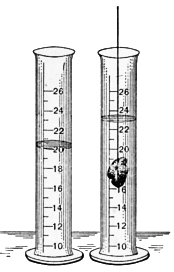 The weight of the displaced fluid is directly proportional to the volume of the displaced fluid (specifically if the surrounding fluid is of uniform density). Thus, among objects with equal masses, the one with greater volume has greater buoyancy. Suppose a rock's weight is measured as 10 newtons when suspended by a string in a vacuum. Suppose that when the rock is lowered by the string into water, it displaces water of weight 3 newtons. The force it then exerts on the string from which it hangs will be 10 newtons minus the 3 newtons of buoyant force: 10 − 3 = 7 newtons. If the first term in this series is the area of the triangle in the illustration, then the second is the sum of the areas of two triangles whose bases are the two smaller secant lines in the illustration, and so on. Archimedes also gave a quite different proof of nearly the same proposition by a method using infinitesimals (see "Archimedes' use of infinitesimals"). He proved that the ratio of the area of a sphere to the area of a circumscribed straight cylinder is the same as the ratio of the volume of the sphere to the volume of the circumscribed straight cylinder, an accomplishment which he had inscribed as his epitaph on his tombstone. Archimedes is probably also the first mathematical physicist on record, and the best until Galileo and Newton. He invented the field of statics, enunciated the law of the lever, the law of equilibrium of fluids, and the law of buoyancy. He was the first to identify the concept of center of gravity, and he found the centers of gravity of various geometric figures, including triangles, paraboloids, and hemispheres, assuming the uniform density of their interiors. Using only ancient Greek geometry, he also gave the equilibrium positions of floating sections of paraboloids as a function of their height, a feat that would be challenging for a modern physicist using calculus. Archimedes was also an astronomer. Cicero writes that the Roman consul Marcellus brought two devices back to Rome from the ransacked city of Syracuse. One device mapped the sky on a sphere and the other predicted the motions of the sun and the moon and the planets (an orrery). He credits Thales and Eudoxus for constructing these devices. For some time the truth of this legend was in doubt, but the retrieval from an ancient shipwreck in 1902 of the Antikythera mechanism, a device dated to 150 – 100 b.c.e.. has confirmed the probability that Archimedes possessed and constructed such devices. Pappus of Alexandria writes that Archimedes had written a practical book on the construction of such spheres entitled On Sphere-Making. This scroll explains the law of the lever and uses it to calculate the areas and centers of gravity of various geometric figures. In this scroll, Archimedes defines what is now called Archimedes' spiral, the first mechanical curve (curve traced by a moving point) ever considered by a Greek mathematician. In this scroll Archimedes proves that the relation of the area of a sphere to that of a circumscribed straight cylinder is the same as that of the volume of the sphere to the volume of the cylinder (exactly 2/3). In this scroll Archimedes calculates the areas and volumes of sections of cones, spheres, and paraboloids. In the first part of this scroll, Archimedes spells out the law of equilibrium of fluids, and proves that water will adopt a spherical form around a center of gravity. This was probably an attempt at explaining the observation made by Greek astronomers that the Earth is round. His fluids were not self-gravitating: he assumed the existence of a point towards which all things fall and derived the spherical shape. In the second part, he calculated the equilibrium positions of sections of paraboloids. This was probably an idealization of the shapes of ships' hulls. Some of his sections float with the base under water and the summit above water, which is reminiscent of the way icebergs float. In this scroll, Archimedes calculates the area of a segment of a parabola (the figure delimited by a parabola and a secant line not necessarily perpendicular to the axis). The final answer is obtained by triangulating the area and summing the geometric series with ratio 1/4. This is a Greek puzzle similar to a Tangram, and may be the first reference to this game. Archimedes calculates the areas of the various pieces. Recent discoveries indicate that Archimedes was attempting to determine how many ways the strips of paper could be assembled into the shape of a square. This is possibly the first use of combinatorics to solve a problem. In this scroll, Archimedes counts the number of grains of sand fitting inside the universe. This book mentions Aristarchus of Samos' theory of the solar system, concluding that it is impossible, and contemporary ideas about the size of the Earth and the distance between various celestial bodies. This work, which was unknown in the Middle Ages, but the importance of which was realized after its discovery, pioneers the use of infinitesimals, showing how breaking up a figure into an infinite number of infinitely small parts could be used to determine its area or volume. Archimedes probably considered these methods not mathematically precise, and he used these methods to find at least some of the areas or volumes he sought, and then used the more traditional method of exhaustion to prove them. ↑ Ship Shaking Device, Syracuse, 214 B.C.E. by Kristin Shutts and Anne-Sinclair Beauchamp.. e-museum, Smith College. Retrieved June 6, 2008. ↑ "Archimedes Death Ray" Experiment Results..MIT. Retrieved June 6, 2008. ↑ "Mythbusters" Discovery Channel.Episode 55: Steam Cannon/Breakfast Cereal.Retrieved June 6, 2008. ↑ Tomb of Archimedes Sources.. NYU Math Dept.Retrieved June 6, 2008. Dijksterhuis, E. J. Archimedes. Princeton, Princeton Univ. Press, 1987. ISBN 0691084211. Kliner, Fred S.; Mamiya, Kliner Christin J. . "Gardener's Art Through the Ages," twelfth ed. Vol II. Los Angeles: Thompson Wadsworth, 2005. Archimedes - The Golden Crown points out that in reality Archimedes may well have used a more subtle method than the one in the classic version of the story. 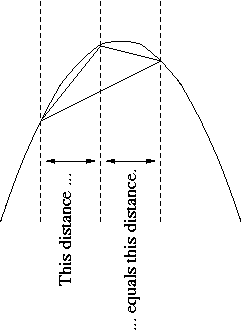 Archimedes' Quadrature Of The Parabola Translated by Thomas Heath. Archimedes' On The Measurement Of The Circle Translated by Thomas Heath. This page was last modified on 12 April 2016, at 15:31.